Unam Sanctam Catholicam: "God cannot be God without man"
My problem is that, properly understood, I think his Holiness is simply wrong. Nothing has become clearer to me than that the essential theology of history is that God has done everything He was going to do in the Christ event. He will not lift a finger to do any more than He has already done. Christ being the only way to get to God, He is not really "intimately close to Man" as you put it. Christ is a man and we can be close to Him if we acknowledge him as King, but in the same way a subject can be close to his monarch. The tragedy of history is that almost no one has any real interest in hailing Christ as King. They are holding out for a "better deal," perhaps one where some of attention gets showered on them. No such deal is forthcoming. C.S. Lewis noted that the Gospel must first start out as bad news. The modern church seems to have no interest in delivering bad news. Friend, you wrote, "He will not lift a finger to do any more than He has already done. Christ being the only way to get to God, He is not really "intimately close to Man" as you put it. Christ is a man and we can be close to Him if we acknowledge him as King, but in the same way a subject can be close to his monarch." By the way, most of the "bad news" you mention is revealed to those that are called through the Spirit. The unbeliever does not need us to point out their faults, we are to share with them the good news! Kind regards, in Christ (King!) Jesus. I both agree and disagree. I agree that it is obedience to Christ that makes us children of God and makes His closeness to us filial and bears fruit. Christ is a King, but that is only one aspect of His relationship to God. God wants us to draw close to him in filial terms. The stories of the lost sheep and the prodigal son do not teach a relationship that is like a subject to a king, but a son to a father. Christ is our brother. Yes, we reverence His kingship, but that is not the only way we relate to Him. Second, God is still intimate to us all by virtue of just being God. He holds everything in Creation. He is intimately close to our very being, closer to us than we are to ourselves. "he is not far from any one of us...For in him we live and move and have our being" (Acts 17:27-28). Just by His omniscience and omnipresence He is intimate to us, but that closeness is not reciprocated unless we submit to Him - He is always close to us, but we are not close to Him unless we become His children. Finally, it is not that the Incarnation brings Christ into communion with every man in particular, but that by joining Himself to flesh, Christ becomes intimately connected with the human race as such, for the Word became flesh. This remains true even if every man were to reject Christ. - He bound Himself to the fate of man. If God is who he IS, nothing can bind him. - He cannot stop seeking man. Same error as Pope Francis. CCC 50 does not support your argument. 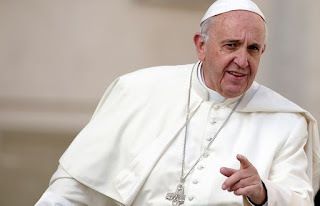 - Francis is right to say God will never be a God without man. Christ will never not be a God-Man. The incarnation changed nothing in the Godhead/the nature of God/The Divinity. The Trinity remains the Trinity without increase or decrease. - He cannot be without man. Error again repeated. - But it must be stressed that this "necessity" is not any kind of compulsion that moves God from without, but rather it flows from God's faithfulness to His own promises. inherently contradictory. Well said, Boniface! Thank you for this article. One minor note, though: the use of "orientation" in the following "... the concept of God's permanent orientation towards man within the economy of salvation ..." is a little problematic, I think. Orientation implies relation; God, of course, is not in relation to any created thing (not even in the economy of salvation). Rather, created things, including the Sacred Humanity of Christ, is in relation to Him, as relation implies dependence (except, it goes without saying, in the special relations within the Trinity of Persons). Interesting. I've never heard that God can't be in a relationship. If that were true, how can the relation between Christ and the Church be described in spousal language, since a spousal relationship is undoubtedly mutual? In 1887, the Holy Office under Pope Leo XIII condemned a host of errors of Fr. Antonio Rosmini-Serbati, including this one: “The love, by which God loves Himself even in creatures, and which is the reason why He determines Himself to create, constitutes a moral necessity, which in the most perfect being always induces the effect…” — CONDEMNED (Denz. 1908). In the primary sense of relation, God is never in relation to anything, i.e. there is no dependence (mutual or otherwise) in God. All of which you basically laid out very neatly in your post. In this same primary sense, though, the Church is in relation to Christ through the Sacred Humanity, and here the Sacred Humanity (and only by concomitance the divine Person, as well) is in relation to creation, as St. Paul mentions in many places ("He is head of the body, the Church," etc.). Of course, in a secondary or "equivocal" sense, the relations within the Trinity are merely relations without any dependence or causality. The divine Person of the Son, then, could not be in relation--strictly speaking--with the Church or any other creature. That of course does not exclude in any way the fact that there is a true and mutual relation between the Sacred Humanity and the Church. For what it's worth, it was not easy for me to grasp the metaphysical (in the Aristotelian sense) notion of relation, and certainly the sloppiness of modern devotional language ("God believes in me" and the like) didn't help.